This book presents the potential uses and benefits of journals for personal and professional development—particularly for those in academic life; and demonstrates journals’ potential to foster college students’ learning, fluency and voice, and creative thinking. In professional life, a journal helps to organize, prioritize and address the many expectations of a faculty member’s or administrator’s roles. Journals are effective for developing time management skills, building problem-solving skills, fostering insight, and decreasing stress. The authors present the background to help readers make an informed decision about the value of journals and to determine whether journals will fit appropriately with their teaching objectives or help manage their personal and professional lives. They offer insights and advice on selecting the format or formats and techniques most appropriate for the reader’s purposes. "Dannelle Stevens and Joanne Cooper have written a comprehensive yet accessible book on the pleasures and challenges of using journals to support reflective learning... This is the book I wish that I'd had years ago when I first started experimenting with journals in my classes. I commend it highly, and believe it has the potential to bring journaling into more widespread and effective practice in reflective learning." "This work presents background on the value of journals so that readers can determine whether journals will fit appropriately with their teaching objectives or help them manage their personal and professional lives... A collection of 19 case studies of journals by faculty, graduate students, and administrators is illustrated with b&w photos, illustrations, and pages from real-life handwritten journals." "As mentioned, this book has lots in it about journaling. If you are new to the idea and want an excellent introduction, the material is here... I could see having this book on the shelf of an EDC or in a library, as it is bound to benefit people interested in learning more about journals and/or addressing specific issues pertinent to the broad area at a pedagogical level... In summary, I comment the book on the whole as one that belongs in a resource center to support teaching and learning." "Journal Keeping makes a clear and compellig argument for what the authors call an "underused and sometimes misunderstood" (xv) educational tool... The book makes a theoretically sound, logistically solid, and ultimately persuasive argument for the keeping of journals." "Dannelle Stevens and Joanne Cooper bring years of personal and professional experience with journal writing to inform the content of their book. This fact creates a level of credibility to their writing, and their approach to the material makes reading the text feel like a converstation with trusted friends. The intent of their volume is to explain the use of journaling in teaching and how to keep a journal to help organize professional lives. Therefore, this book should appeal to a variety of academic readers including faculty members, students, staff and administrators. In addition, both the novice and seasoned journal writer should find several takeaways... Among the several strengths of the book is the potential for immediate application of journal writing strategies to support active learning... Journal Keeping should be on everyone's short list. The writing is approachable, the book well organized and the material easy to implement in practice. Rarely have I found a book that I have been so enthusiastic about and that I highly recomment to others." "Making a written record of our lives, experiences, and thoughts often helps us to understand them better, provide an emotional relief, memorialize accomplishments, benefi our posterity, and estbalish the only kind of immortality that most of us can hope for. That's why Journal Keeping is such an invaluable and highly recommended instructional manual for aspiring diarists and journalists... It is a highly recommended addition to personal, professional, academic, and community library reference collections and supplemental reading lists." 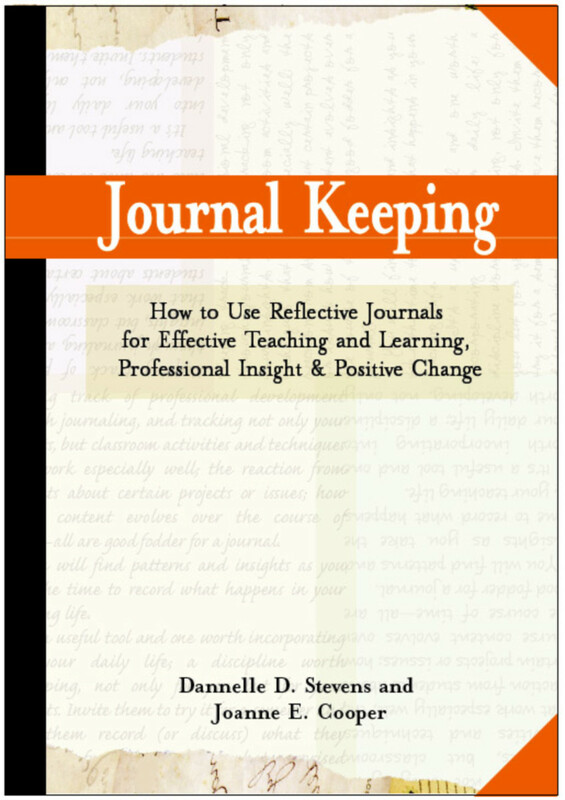 "Journal Keeping is a superb tool for educators who want to be reflective practitioners, and help their students become reflective learners. But it is not a typical 'how-to' text, as the epigraph to Chapter 1 suggests: 'The unexamined life is not worth living.' Elaborating on Socrates, Stevens and Cooper explore the rationale, process and impact of journal keeping on educators and students alike, helping us overcome familiar obstacles; e.g., 'How can you possibly evaluate a student journal?' As one who likes to amend Socrates with the words, 'If you choose to live an unexamined life, please do not take a job that involves other people,' I hope this fine book will be widely read and used." “An impressively complete and well organized exploration of the uses of journal writing. It provides rich backing for John Dewey’s key insight, namely that it’s not experience that makes us learn, it’s reflection on experience." "Most historians consider personal journals as excellent primary sources, but few of my colleagues are familiar with using them as a core component of student assessment. In Journal Keeping: How to Use Reflective Writing for Learning, Teaching, Professional Insight and Positive Change (Stylus, 2009), Dannelle D. Stevens and Joanne E. Cooper lay out the argument that course journals give students not merely a place to put notes, but they also create a space for instructor-directed reflection on learning. Current research makes it clear that taking knowledge and connecting it with one’s own experience significantly improves retention of that knowledge. Stevens and Cooper discuss a wide range of possible uses: asking students to write out summaries of the main points of each lecture at its conclusion, writing five-minute reflections after discussions, logging progress on class projects, going back to earlier entries and annotating or updating with new ideas, and so on. They also suggest a number of ways to make journal grading a breeze." Afterword; Appendices: A) Journal Writing Techniques; b) Contributor Contact Information; References; Index. Dannelle D. Stevens is a tenured professor in the Department of Curriculum and Instruction at Portland State University in Oregon where she has been since 1994. Her roots, however, are in the public school classroom where she taught middle school and high school social studies, language arts, and special education for 14 years across four school districts and three states. She received her master's from the University of Utah in 1983, and a doctorate in educational psychology from Michigan State in 1991. Before coming to PSU she taught at Whitman College in Walla Walla, Washington. Whether the topic is rubrics, journal writing, action research or academic writing, her work centers on how adults reflect on what they do and, then, act on those reflections. One of Dr. Stevens' underlying assumptions is that cognitive, social and emotional development does not end with the teenage years but continues through the lifetime. Besides over 75 conference presentations, she has written three books, all designed to impact development of her fellow faculty and their students. Her first book, co-edited with Joanne Cooper, Tenure in the Sacred Grove: Issues and Strategies for Women and Minorities, (SUNY Press, 2002), was written to help faculty women and minorities negotiate the path to tenure. Introduction to Rubrics, now in its second edition, and co-authored with Antonia J. Levi, and Journal Keeping, co-authored with Joanne Cooper, are both published by Stylus Publishing. In addition to teaching classes, she has taken on leadership positions in the department and campus-wide. In the Curriculum and Instruction Department, Dr. Stevens leads teacher licensure cohorts and coordinates the MA/MS program for experienced teachers. For the university at large, she works within the Center for Academic Excellence as faculty-in-residence for assessment. She is chair of the Institutional Assessment Council. Joanne E. Cooper is a Professor in the Department of Educational Administration, University of Hawaii at Manoa.